Celebrate 75 Years of Murray’s Cheese With Us! 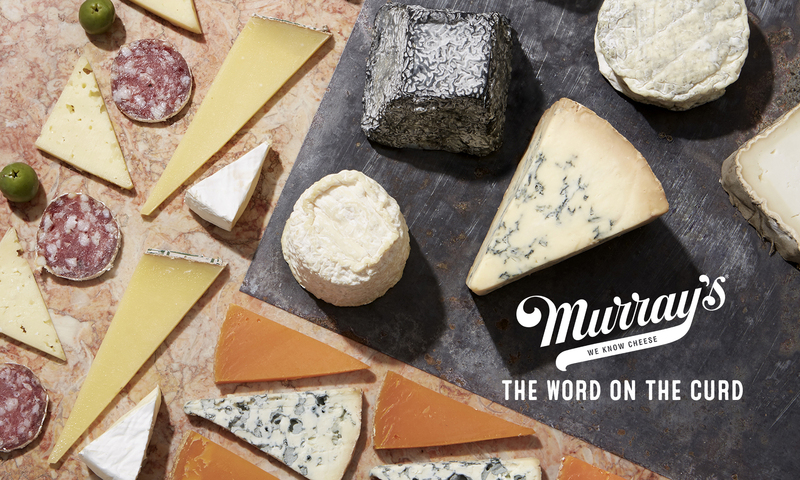 Murray’s, New York’s oldest cheese shop, is celebrating our 75th anniversary from October 12 – October 25. We’re busy with special dinners, promotions, classes and giveaways–please join us! Check out our lineup here. We have grown from 3 stores in 2008 to nearly 250 stores today, and we continue to grow every day. By 2016, we will have 350 Murray’s stores within Kroger supermarkets throughout the country. We sell 6 million pounds of cheese a year. That’s a whole lot of cheese. We’ve kept our neighborhood soul, while becoming the national cheese brand. We’ve opened a shop in Grand Central Market, created state-of-the-art caves to ripen cheese to perfection, launched a beloved cheese bar, and built a rich and growing partnership with The Kroger Company. What is the Murray’s experience? It’s about sharing the cheeses (more than 150 varieties in any given store!) and many other artisan-made goods that we find across the world. 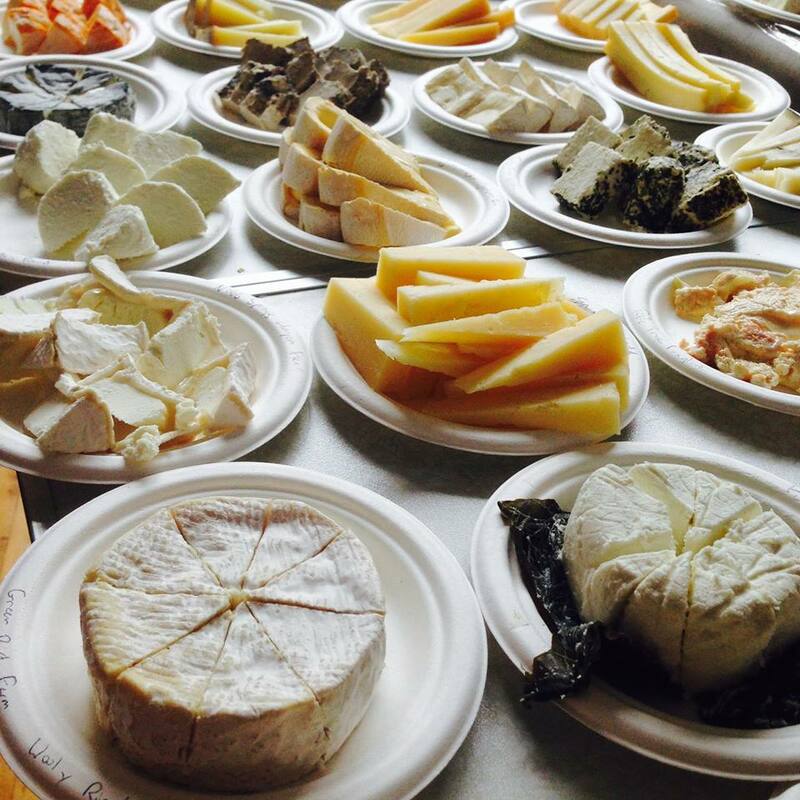 It’s about teaching you cheese through tasting and introducing you to your cheesemaker. It’s about spreading joy via cheese. We’ll never stop learning and sharing cheese with you, every day of the year. You–our customers, our community, our fellow cheese-lovers–are what makes us great. Thank you for a wonderful 75 years. Here’s to 75 more! Not to brag, but we at Murray’s are pretty lucky. Sometimes you find yourself in Northern Italy, halfway between tasting Prosciutto di Parma smack dab in the middle of Parma and joining thousands of cheesemakers and cheese lovers in the cradle of Slow Food in Bra, zipping along an autostrada lined with wide open fields to one side and craggy mountains to the other. The sun shines, the Italian pop blasts, and your conversation cycles on repeat, coming back again and again to the singular, wondrous thought: this is work. We are at work right now. I may be biased—part of my heart lives in Bologna, where I lived as an undergraduate—but there is no better place to immerse yourself in food culture than Italy. Even if you aren’t there specifically for food-related purposes, like we were, it’s nearly impossible to avoid how deeply the roots of Italian culture are related to the kitchen. In the past few days, however, this love of food—and the impact is has on our world at large—went deeper still, with a confluence of events that warranted a tour, Murray’s-style. We began our journey in Milan, where the 2015 Expo is winding down a several month stint outside the city. With an emphasis on sustainability and biodiversity and a special focus on how food and food systems support our global future, the Expo was like an educational Epcot Center on steroids. Each country, invited to participate and given no specific instructions other than the overall focus and spatial constraints, brought their A-game in representing themselves. Architecture buffs would marvel at the absolutely extraordinary structures built to house each country’s variation on a theme—the straw lotuses flanking the Vietnamese pavilion, the dry stucco of the Middle Eastern countries, and the rah-rah Americana of our own. The American pavilion emphasized the methods our country will focus on in the coming years in order to help create sustainable food systems. Our friendly guide, an intern with the state department, shared the emphases: food security and farming and policy and industry, nutrition and cooking an research. Food trucks parked outside serving regional American street food. A series of short, fun videos walked folks from around the world through the American food traditions that perhaps go unnoticed in the rest of the world, in favor of our more popular food brands (there was, in fact, a whole McDonalds pavilion, as if they were their own sovereign state of fries). The coolest feature, and indicative of the future food trends sprinkled throughout the content of the Expo, was an entire exterior wall devoted to a patchworked vertical garden, great swaths of kale and hot peppers and cherry tomatoes, the seeds sent from Michelle Obama’s garden and grown there in Italy. Here’s to small footprint farming with great potential for the future! No rest for the weary when you’re in Italy. In the early morning mist, we passed from Lombardy to Emilia Romagna, our sights set on two out of the holy trifecta: Parmigiano Reggiano and Prosciutto di Parma. 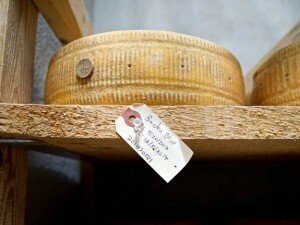 To watch Parmigiano Reggiano be made and aged is like a glimpse into history. Copper cauldrons lined up in the make room, the hanging smell of whey in the air, great triton-like tools with a wired globe on the end, carefully thrust in an out of coagulating curd at just the right time, with just the right amount of force. And then, wheels on wheels on wheels, just casually sitting there on row after row of shelving to the ceiling. Tens of thousands of them, like ingots in a vault (and the perfect backdrop for many a hairnet-clad selfie). Giant crumbles of a cheese that hasn’t seen the light of day for two years—there’s no better breakfast. But what is formaggio without salumi? Onto our friends in meat, and a tutorial on the alchemy that is aging Prosciutto di Parma. Just two ingredients, pork and salt, perhaps even simpler than cheese in its processing, but equally magical. Great haunches of pear-shaped pork legs hang in room after room, hand-covered in sea salt in one, pork fat in another, all quietly hanging there and biding their time as they transform from raw meat to slices of silky, rosy Prosciutto di Parma. Eating a plateful of it with a glass of Prosecco: this is work. We are at work right now. And finally, onto the main event: Slow Cheese a biannual celebration of all things cheese. We’ll dive deeper into this massive, town-wide festival in the next few days, but a few key trends from walking the show: we’ll see more and more water buffalo milk cheese coming from less traditional areas than the historic area around Naples, and even some hints of camel’s milk cheese to come! I was pumped about the burgeoning artisan cheese of Scandinavia, with great new options from Denmark and Sweden. Not to mention the exploding craft beer scene in Italy, often neglected in favor of noble grapes and aperitivi. It’s the third time I’ve been fortunate enough to attend Cheese, as it’s universally called, and each time is better. I revel in guiding newer colleagues through the madness, introducing them to cheesemakers from around the world, getting lost in my own translation, surrounded by the burbles of Italian. On my first trip, six years ago, I dorked out at the list of attendees from just the American side: the rock stars of American cheese. Now, they’re friends, and this trip is yet another chance to share my own passion with our world with those who are newer to it. Because even this many years later, I too will look at my pictures, now back on terra firma and home in New York, and marvel: this is work. That was work, and isn’t that amazing? Wine has sommeliers, beer has cicerones, and now…cheese has Certified Cheese Professionals (CCPs). Today we’re congratulating eight Murray’s cheese whizzes and 20 Kroger Red Jacket team members for becoming CCPs and achieving the ultimate in cheese recognition. They join four Murray’s folks and 20 Kroger employees who hold this distinguished standing…for a total of 52 CCPs in our Murray’s community. “The opportunity to work with and learn from who I consider to be the best minds in cheese today has been a once-in-a-lifetime experience for me,” says Connor Pelcher, who works in our Wholesale department and just got the news of his CCP status. (Congrats, Connor!). 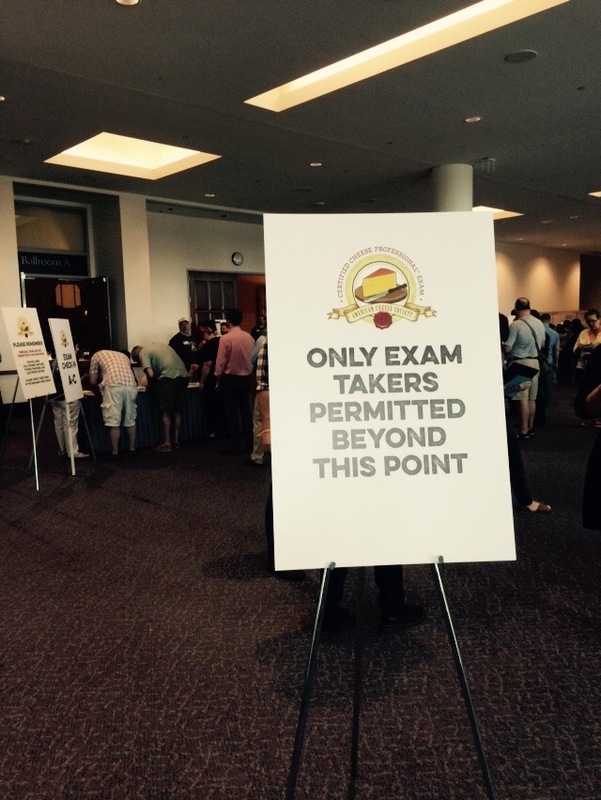 The exam was first given in 2012, and it reflects a recent groundswell of professionalism in our world – cheese land. According to a 2012 report from the National Association for the Specialty Food Trade, cheese is the largest specialty food category in the US. Murray’s is at the forefront of establishing, growing and supporting a career path (a multitude of career paths!) in cheese. “The ACS CCP Certification is a mark of excellence and achievement that reflects a commitment to the best possible care for cheese and service to those that love it,” says the American Cheese Society. Passing the American Cheese Society’s CCP exam is no small feat. Before being allowed to sit for the exam, cheese people must have 4,000 hours of work and/or formal education in the cheese-field under their belt. Then, they’re tested for three hours on the ins and outs of all things cheese: chesemaking and aging, storage and handling, nutrition, history, distribution, categorization…whew. It’s a rigorous test of cheese knowledge across all areas of our field. This is the very highest standard for cheese professionals. “It will be nice for people to have a more systemized way to learn their industry, rather than getting their info from word of mouth,” Summer says. 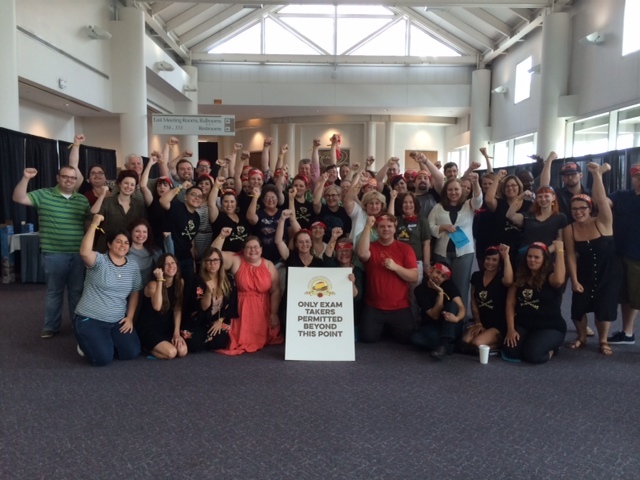 We’re proud of instructing and empowering passionate, knowledgeable and inspiring cheese professionals – by the end of this year, we will have 3,000 Red Jackets in 250 stores around the country. We’re deeply committed to spreading the curd, and supporting and training those who make it their life’s work to do so. “I truly hope that I am able to pass down what I’ve learned to our next generation of CCPs with as much grace and passion as my peers have shown me,” Connor says. Congratulations to the new CCPs, and best of luck to our many, many future cheese stars. Stephany Munera, our badass Facilities Manager, had never worked a food truck before. 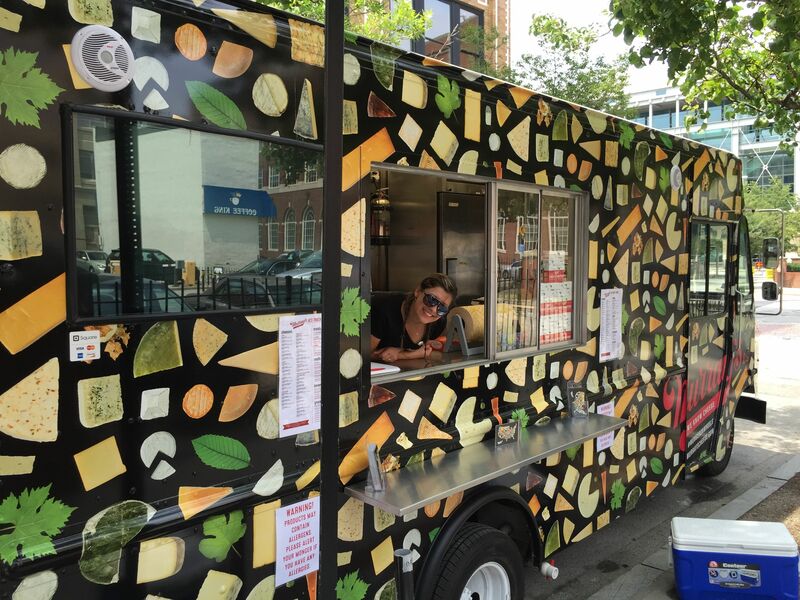 That all changed last week at the American Cheese Society Cheese Camp in Providence, RI, when Steph spearheaded the debut of our #mongeronwheels, the Murray’s Cheese Truck, in all its cheesy glory. Quick background: This year marks Murray’s Cheese’s 75th anniversary, and we celebrated by slinging cheese, charcuterie, melts and merch from our brand new and shiny cheese truck at ACS Cheese Camp. The American Cheese Society conference and contest is a grand celebration of all things American cheese—here’s a lowdown. Steph was the woman for the job. 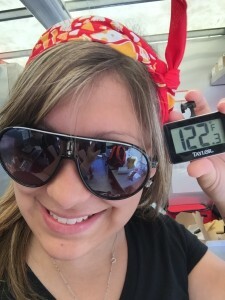 She took a crash course in all things food truck. Every morning, she woke up at the crack of dawn to get to the parking park and pick up the truck. Every single part had to be strapped down, or else it would rattle around on the roads of Rhode Island. She drove the truck, with lots of finesse and style, to its starting point, where the Murray’s crew met her to prep for the day. Cheeses and meats had to be sliced, the grilled cheese press revved up, ice stocked, coolers refilled and the day’s goods organized and route planned. Then our team began the hard work of handing out samples, chatting cheese, and selling our delicious wares. After a long, busy, on-her-feet, super sweaty day and night in the truck, everything had to be cleaned until it sparkled. Then Steph drove back to the parking lot (the truck’s hotel), plugged it in, checked the generator, refilled the gas and oil and emptied the 40-gallon water tank. 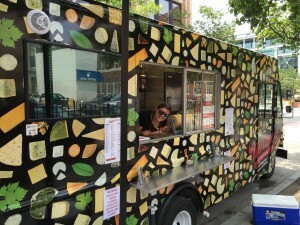 A cheese truck is a lot of work! “At the end of the week, I missed the truck. 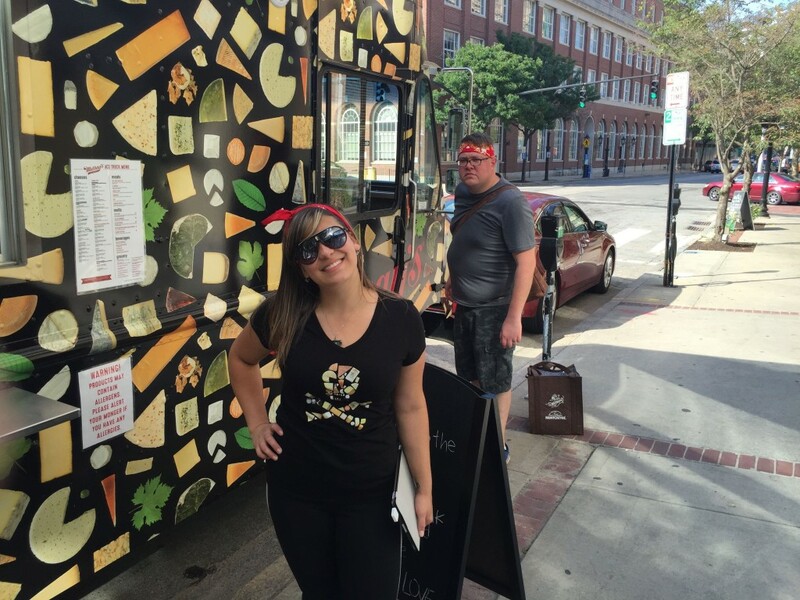 I had come to love it.” Steph sometimes wakes up at night, dreaming of the cheese truck. So do we. Thank you, Steph! You are a true cheese truck hero.